In this season of Advent, we are reminded to wait and prepare for the coming of Christ. It is a time of new hope and new birth. And yet, these words from Isaiah sound harsh and devastating. Has God forgotten the people? Are the people of God too far-gone to be redeemable? Has God given up? But then the passage reminds us that, like clay, the people need to be molded by God into what God calls them to be. The writer calls upon God to remember the people, to remember that they are children of God. We are reminded how badly we need God, how desperately we need God to once again break into the darkness of our lives. This section of Isaiah was probably not written by the actual prophet Isaiah but, rather, by a post-exilic writer that is trying to remind a struggling people that God had always been with them and would remain with them even in this time of despair. The context in which it is set is full of hostilities. The society is getting farther and farther away from what it is called to be. The people have turned away. And so, almost with a feeling of last desperation, the writer begs God to save them, to “come down” and redeem them. There is a sense here of a removed deity, a God who is “up there”. And yet we can identify with that feeling of God’s absence, of not being able to feel God’s Presence in our midst. Has God deserted them? Is it, then, God’s fault that the people have turned away? But the coming of God shatters that elusion. God comes in ways and places that we do not expect God. That’s what this season of Advent reminds us. We are not called to plan for God’s coming the way we plan for our Christmas festivities. We are, rather, called to open ourselves to the way that God will be revealed in our lives. We, like these post-exilic people yearn desperately for God. We beg for God to come into our lives. And, yet, we too, are out of step. God’s coming does not begin with light. God’s coming begins with darkness that the light enters. So, perhaps if we turn out all the bright lights that we insist we need, we will finally see that light that is just over the horizon. God does not come because we are ready or because we are prepared or because we’ve gotten all our shopping done. God comes into our waiting, into our wilderness. So, wait with the anticipation not of how God will come but that God will. b. What gets in the way of our anticipation of God’s Presence in our lives? c. What does this passage say to us about waiting for God? d. How can this passage speak to our world today? Paul’s known letters to the people of the church at Corinth often deal with the notion of spiritual gifts. Perhaps it was something of which they needed to be reminded. In the first century, Corinth was a bustling city replete with wealth and material possessions. But, obviously, that was not all they were about. They were people of God. God had instilled in them ample spiritual gifts for what they needed. It is not a new theme. We, too, have been instilled with the gifts of the Spirit. Paul implores the Corinthians to wait for God but not passively. Rather, they are called to do the work of God even as they wait for the full glory of God to come. We, too, are called to this active waiting. God will come when God will come. But, in the meantime, we are already the people of God called to the work of God. And God has equipped us for the journey. Now keep in mind that these first-century people assumed that God was going to return any day or any minute. The possibility that our generation would still be waiting for the fullness of God’s Kingdom would have been positively anathema to them. And as time went on, they, like those post-exilic Israelites centuries before them took matters into their own hands. Waiting is difficult for all of us though. Our world tends to operate on instant gratification. When we don’t get the “answer” from God that we think we need, we too tend to try to take care of things ourselves. In fact, we admire people that “get things done,” that take hold of the situation and make things happen. But that’s not what faith is about. Faith is about expectation. Faith is about anticipation. In fact, faith is about waiting. A life of faith is one of active waiting, believing that God will come when God will come and living a life with that vision in mind, a vision of peace, and justice, and unity within the Presence of God. But don’t wait to begin. b. How does this passage speak to the concept of “waiting” that Advent holds? c. What does this notion of “active waiting” look like for us? d. With what spiritual gifts has God equipped our own community of faith? We begin this Year B of our Lectionary year with a reading from The Gospel According to Mark, whose writer really just sort of skips over the whole Advent / Christmas thing and cuts right to the chase. Most over-personalized readings of this Scripture leave us with a fear of what comes next. (Oh my, am I ready? What’s going to happen to me?) We quickly go to visions of those who are unprepared being uncomfortably ripped from what they know or, as a series of cult fiction writings would depict it, being flat out left behind! But keep reading…this is not meant to scare us; it is meant to wake us up. Sure, it is meant to remind us that there is something coming! We do not want to miss it. But, more than that, we do not want to miss the present spiritual awakening that we are all having in this very moment. We have skewed our understanding of Advent a bit. I think all of us know that. But, really, can you blame us? The world is so bent on being prepared for what comes next that it tends to live one season ahead at all times–the Halloween decorations go up the end of August, the Thankgiving decorations go up the end of September, and the Christmas decorations go up the end of October. The twelve days of Christmas tide, will of course, be filled with merchandise sales, a couple of unreplaced burned out Christmas lights, and and a flowering of little red hearts filled with candy to make sure we’re ready for the next thing. Somewhere in there, Advent is lost. Oh, we Christians, do alright with it. 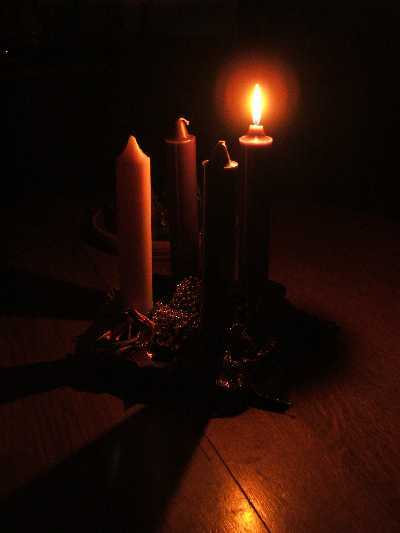 We faithfully light one candle at a time while we begrudingingly ward off the singing of any Christmas carols. But Advent is not merely a season of preparation for Christmas. It is much, much more. It is from the Latin “Adventus“, which means arrival or coming. It is not really meant to be only a time of shopping and checking off our “to do” list for the December 25th festival. Rather, Advent is our awakening to the realization that the Divine is even now spilling into our lives, even now a new humanity is being birthed, and even now all of Creation is being reformed and recreated. b. How does this passage speak to us in our world today? c. So what does this concept of “staying awake” mean to you? On the “Bigness Of God” I agree most humbly. On that note this is my problem with the Literalest & Fundamentalist “?Christians?” That they want to make God small and some Harry Potter type magician. Course this very statement makes me guilty of the very sin I condemn them for. Namely sitting in judgment of there Christianity!